The Indianapolis Star is a morning daily newspaper that began publishing on June 6, 1903, in Indianapolis, Indiana, United States. It has been the only major daily paper in the city since 1999, when the Indianapolis News ceased publication. It won the Pulitzer Prize for Investigative Reporting twice, in 1975 and 1991. It is currently owned by the Gannett Company. The Star marquee at Circle Centre in downtown Indianapolis. The Indianapolis Star was founded on June 6, 1903, by Muncie industrialist George F. McCulloch as competition to two other Indianapolis dailies, the Indianapolis Journal and the Indianapolis Sentinel. It acquired the Journal a year and two days later, and bought the Sentinel in 1906. Daniel G. Reid purchased the Star in 1904 and hired John Shaffer as publisher, later replacing him. In the ensuing court proceedings, Shaffer emerged as the majority owner of the paper in 1911 and served as publisher and editor until his death in 1943. Central Newspapers, Inc. and its owner, Eugene C. Pulliam—maternal grandfather of future Vice President Dan Quayle—purchased the Star from Shaffer's estate on April 25, 1944, and adopted initiatives to increase the paper's circulation. In 1944, the Star had trailed the evening Indianapolis News but by 1948 had become Indiana's largest newspaper. In 1948, Pulliam purchased the News and combined the business, mechanical, advertising, and circulation operations of the two papers, with the News moving into the Star's building in 1950. The editorial and news operations remained separate. Eugene S. Pulliam took over as publisher upon the death of his father in 1975, a role he retained until his own death in 1999. In September 1995, the newsroom staffs of the Star and the News merged. In 1999, the News ceased publication, leaving the Star as the only major daily paper in Indianapolis. Soon thereafter the trustees of Central Newspapers, Inc., the owner of the Star and other newspapers in Indiana and Arizona, began investigating the sale of the small chain to a larger entity. In 2000, the Gannett Company acquired the paper, leaving Indianapolis with no locally owned newspaper other than the Indianapolis Recorder, a weekly mainly circulated in the African-American community. On July 27, 2012, it was announced that The Indianapolis Star would relocate from its headquarters at 307 North Pennsylvania Street. It was later announced that the new location would be the former Nordstrom department store in Circle Centre Mall. This move took place from the summer to fall of 2014. The former location had been used since 1907. After Larry Nassar, USA Gymnastics national team osteopathic physician, was sentenced to up to 175 years in prison in January 2018 for sexually abusing female athletes, the prosecutor in the case specifically praised The Indianapolis Star for uncovering Nassar's decades-long history of abuse. The Star began its investigative reporting into Nassar and USA Gymnastics in 2016 and published its first related article in August 2016 when it shed light on USA Gymnastics' failure to properly investigate credible complaints of sexual abuse or pass the complaints on to police. After the August 2016 story, one of Nassar's victims, Rachael Denhollander, approached the Star about Nassar and USA Gymnastics' failure to investigate her complaint about him. This resulted in a September 2016 story on Nassar specifically. After the Nassar story, the Star was approached by a large number of Nassar's victims who shared similar stories of abuse. Nassar was charged with criminal sexual conduct in November 2016. The Star has won the Pulitzer Prize twice for investigative reporting. In 1975, the Star was honored for its 1974 series on corruption within the Indianapolis Police Department. It was cited again in 1991 for its 1990 series on medical malpractice. The Indianapolis Star has the largest and most advanced printing presses in the nation. The Pulliam Production Center at 8278 N. Georgetown Road on the northwest side of Indianapolis cost $72 million and covers 200,000 square feet (19,000 m2); printing of the Star at the facility began in 2002. The press hall that houses the four MAN Roland Geoman presses has 30,672 square feet (2,850 m2) on two levels. Each of the presses weighs 2,100 short tons (1,900 t), stands seven stories tall, and can print 75,000 papers an hour. With all four presses running, 300,000 papers can be printed in just one hour. The Pulliam Production Center allows tours of the facility. Former headquarters at 307 North Pennsylvania Street. Part of the newspaper's masthead displays the text of 2 Corinthians 3:17: "Where the Spirit of the Lord is, there is liberty." ^ "2017 Annual Report". Gannett. 2014. Retrieved October 22, 2018. ^ a b c "About Gannett: The Indianapolis Star". Gannett Co., Inc. Archived from the original on June 13, 2006. Retrieved May 29, 2007. ^ a b c d "A History of The Indianapolis Star". Library Fact File. 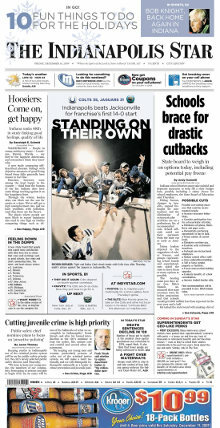 The Indianapolis Star. July 1, 2003. Archived from the original on December 11, 2001. Retrieved October 26, 2011. ^ "The Star joins Gannett chain". The Indianapolis Star. August 1, 2000. Archived from the original on June 20, 2001. Retrieved May 29, 2007. ^ "Karen Ferguson: New IndyStar home, same news values". The Indianapolis Star. September 17, 2014. Retrieved September 28, 2014. ^ a b Eric Levenson. "How the Indy Star and Rachael Denhollander took down Larry Nassar". CNN. Retrieved January 27, 2018. ^ Indianapolis Star - About Us Retrieved September 20, 2016. ^ "Indianapolis Star Starts Production with First of Four Geoman Presses". What They Think. April 19, 2002. Retrieved October 26, 2011. Wikimedia Commons has media related to The Indianapolis Star. This page was last edited on 14 February 2019, at 21:34 (UTC).